A few weeks ago, I was thinking, what am I really missing in my collection? Two watches sprung to mind, a small seconds watch and a Mickey Mouse watch. As fate would have it, my most recent visit to my favorite antique store (my secret) yielded both! 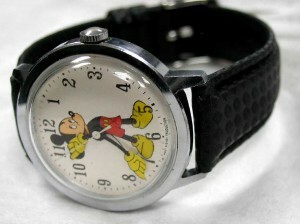 What we have here is a Timex Mickey Mouse watch from 1971. Before 1971, they were sold as Ingersol watches, but for just one year, they were sold as Timex watches. Bradley bought the rights after that, so this is a pretty unique piece. I found it on the original strap as well! The watch itself is a wonderful, classic Mickey Mouse watch. The Mickey Mouse image is what most people think about when they think of him, drawn in the style of the 1950’s through 1970’s . The colors/printing is a perfect shape. The dial is a pearl looking metallic finish with simple, Arabic markers. The bottom of the dial is marked Walt Disney Productions. The hour and minute hands are Mickey’s arms, obviously. They end is large, cartoon hands, which are surprisingly easy to read. All the printing and cutting is done very well. The seconds hand is a simple, chrome plated stick and works well, by not distracting from the overall motif. 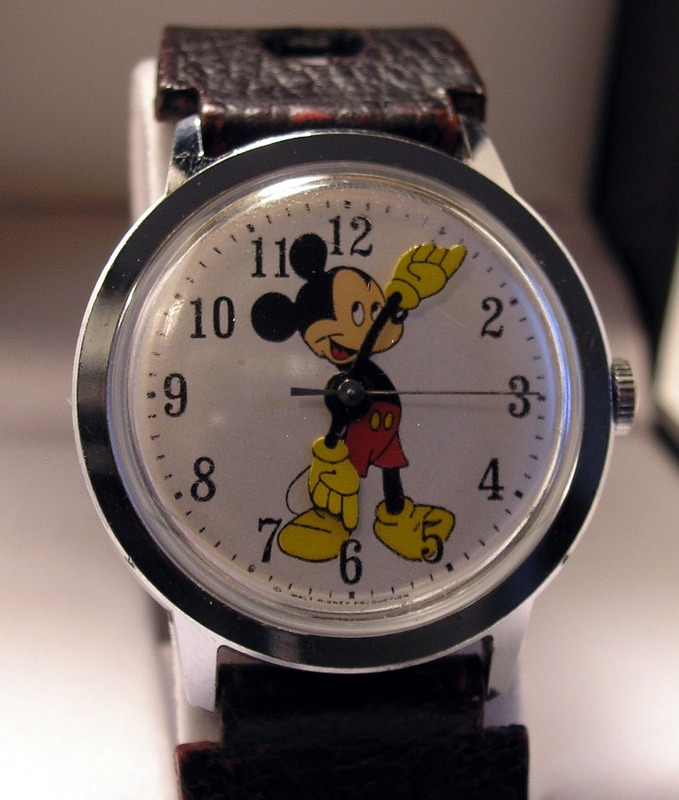 I like how the watch is whimsical, but still practical, since the hour markers are printed in front of, not behind Mickey. The minute markers are simple lines. The case is base metal with a thick chrome plating. The plating is in very good shape, with only a few, small dings. The crown is unsigned, but still has most of the original chrome plating. The case back is stainless steel and has the typical markings of an early 70’s Timex. It has 18mm lugs, which makes it easy to find bands for it. The movement is an unremarkable Timex 22, hand wind only, with no date. A dirt simple, but reliable pin lever movement. Accuracy is about +/- 30 seconds a day. Nothing wonderful, but very typical of this vintage and quality of watch. With Mickey’s cartoon hands, you really don’t mind being a minute off. Overall, I really love this watch. It was found in all original condition and in great shape. I was tempted to sell this watch, but I really like wearing it. I removed the original band (and saved it for posterity/resale) and replaced it with a carbon fiber band. It looks surprisingly good on such a modern material and it makes the black printing really pop on the dial. I know this watch is worth 4 to 8 times more than I paid for it, but, for now, it is a keeper and helps round out my collection perfectly. Case: 36mm, base metal with chrome plating. Back: Stainless, Marked Water Resistant, Resistant, Chrome plate over base metal. Movement: Hand winding only, Timex no-jewel pin lever escapement. Caliber 22, 18000 BPH. Other: Currently on carbon fiber band.